For other uses, see Serval (disambiguation). The serval (Leptailurus serval) /ˈsɜːrvəl/ is a wild cat native to Africa. It is rare in North Africa and the Sahel, but widespread in sub-Saharan countries except rainforest regions. On the IUCN Red List it is listed as Least Concern. It was first described by von Schreber in 1776. It is the sole member of the genus Leptailurus. Three subspecies are recognised. The serval is a slender, medium-sized cat that stands 54–62 cm (21–24 in) at the shoulder and weighs 9–18 kg (20–40 lb). It is characterised by a small head, large ears, a golden-yellow to buff coat spotted and striped with black, and a short, black-tipped tail. The serval has the longest legs of any cat relative to its body size. The serval prefers areas with cover such as reeds and tall grasses and proximity to water bodies, such as wetlands and savannahs. 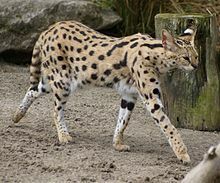 It occurs in protected areas across its range, and hunting of servals is either prohibited or regulated in several countries. Felis serval was first described by German naturalist Johann Christian Daniel von Schreber in 1776. The generic name Leptailurus was proposed by Nikolai Severtzov in 1858. It is the sole member of this genus. In the 19th and 20th centuries, some taxonomists inspected serval skins and identified two species on the basis of coat pattern: Felis serval (serval), with large, pronounced spots, and F. servalina or F. ornata (servaline cat), marked by freckle-sized dots. F. servalina was first described in 1839 by Irish naturalist William Ogilby from Sierra Leone; in 1867, British zoologist John Edward Gray described F. herschelii from an Indian skin, which was probably the same as the servaline cat. In 1907, British zoologist Reginald Innes Pocock commented that the two forms should be considered independent species, but reverted from this in 1917. Eventually, the two forms came to be recognised as the same species. Another form, F. himalayanus (Himalayan serval), was described from a skin procured from the Indian Himalayan Region; however, Scottish naturalist William Jardine noted in 1843 that no such specimen had been identified by him or his colleagues, and that it differed considerably from the common serval. 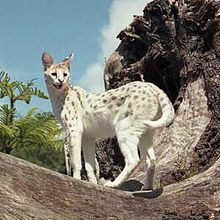 In 1944, Pocock identified three races of the serval from northern Africa. The phylogenetic relationships of the serval have remained in dispute; in 1997, palaeontologists M. C. McKenna and S. K. Bell classified Leptailurus as a subgenus of Felis, while others like O. R. P. Bininda-Edmonds (of the Technical University of Munich) have grouped it with Felis, Lynx and Caracal. Studies in the 2000s and the 2010s show that the serval, along with the caracal and the African golden cat, forms one of the eight lineages of Felidae. According to a 2006 genetic study, the Caracal lineage came into existence 8.5 million years ago, and the ancestor of this lineage arrived in Africa 8.5–5.6 mya. The name Leptailurus may have been constructed from the medieval Greek λεπταλέος or λεπτός meaning "fine, delicate". The name "serval" could have been derived from the Medieval Latin words Lupus cervalis ("deer-like wolf") or from its Portuguese equivalent lobo-cerval (referring to the Iberian lynx). The first recorded use of this name dates back to 1771. Another name for the serval is "tierboskat", Afrikaans for tiger-bush-cat. The coat is basically golden-yellow to buff, and extensively marked with black spots and stripes. The spots show great variation in size. Melanistic servals are also known. Facial features include the brownish or greenish eyes, white whiskers on the snout and near the ears, ears as large as those of a domestic cat (but large relative to the size of the head) and black on the back with a white horizontal band in the middle, whitish chin, and spots and streaks on the cheeks and the forehead. Three to four black stripes run from the back of the head onto the shoulders, and then break into rows of spots. The white underbelly has dense and fluffy basal fur, and the soft guard hairs (the layer of fur protecting the basal fur) are 5–10 centimetres (2–4 in) long. Guard hairs are up to 3 centimetres (1 1⁄4 in) long on the neck, back and the flanks, and are merely 1 centimetre (1⁄2 in) long on the face. The closely set ears are black on the back with a horizontal white band; the ears can rotate up to 180 degrees independently of each other. The serval has a good sense of smell, hearing and vision. 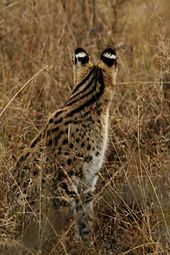 The serval is similar to the sympatric caracal, but has a narrower spoor, a rounder skull, and lacks its prominent ear tufts. The African golden cat is darker, with different cranial features. It resembles the cheetah in its build and coat pattern, though not in size. The serval shares its adaptations to its marshy habitat with the jungle cat; both cats have large and sharp ears that help in locating the prey efficiently, and their long legs raise them above muddy ground and water. In North Africa, the serval is known only from Morocco and has been reintroduced in Tunisia, but is feared to be extinct in Algeria. It inhabits semi-arid areas and cork oak forests close to the Mediterranean Sea, but avoids rainforests and arid areas. It occurs in the Sahel, and is widespread in Southern Africa. It prefers areas with cover, such as reeds and tall grasses, proximity to water bodies such as wetlands and savannahs. It inhabits grasslands, moorlands and bamboo thickets at high altitudes up to 3,800 m (12,500 ft) on Mount Kilimanjaro. In 2014 and 2015, it was recorded in the floodplains and gallery forests of Benin’s Pendjari National Park by camera-traps. In the East Sudanian Savanna, it was recorded in the transboundary Dinder–Alatash protected area complex during surveys between 2015 and 2018. In Zambia's Luambe National Park, the population density was recorded as 0.1/km2 (0.26/sq mi) in 2011. In South Africa, the serval was recorded in Free State, eastern Northern Cape, and southern North West. In Namibia, it is present in Khaudum and the Mudumu National Parks. The serval's white spots on the backs of its ears are thought to play an important role in communication. The serval is active in the day as well as at night; activity might peak in early morning, around twilight and at midnight. Servals might be active for a longer time on cool or rainy days. During the hot midday, they rest or groom themselves in the shade of bushes and grasses. Servals remain cautious of their vicinity, though they may be less alert when no large carnivores or prey animals are around. Servals walk as much as 2 to 4 kilometres (1 1⁄4 to 2 1⁄2 miles) every night. Servals will often use special trails to reach certain hunting areas. A solitary animal, there is little social interaction among servals except in the mating season, when pairs of opposite sexes may stay together. The only long-lasting bond appears to be of the mother and her cubs, which leave their mother only when they are a year old. Both males and females establish home ranges, and are most active only in certain regions ('core areas') within them. The area of these ranges can vary from 10 to 32 square kilometres (4 to 12 square miles); prey density, availability of cover and human interference could be significant factors in determining their size. Home ranges might overlap extensively, but occupants show minimal interaction. Aggressive encounters are rare, as servals appear to mutually avoid one another rather than fight and defend their ranges. Agonistic behaviour involves vertical movement of the head (contrary to the horizontal movement observed in other cats), raising the hair and the tail, displaying the teeth and the white band on the ears, and yowling. Individuals mark their ranges and preferred paths by spraying urine on nearby vegetation, dropping scats along the way, and rubbing their mouth on grasses or the ground while releasing saliva. Servals tend to be sedentary, shifting only a few kilometres away even if they leave their range. The serval is vulnerable to hyaenas and wild dogs. It will seek cover to escape their view, and, if the predator is very close, immediately flee in long leaps, changing its direction frequently and with the tail raised. The serval is an efficient, though not frequent, climber; an individual was observed to have climbed a tree to a height of more than 9 metres (30 feet) to escape dogs. Like many cats, the serval is able to purr; it also has a high-pitched chirp, and can hiss, cackle, growl, grunt and meow. 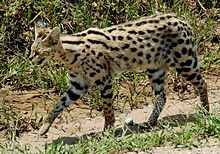 The serval is a carnivore that preys on rodents, particularly vlei rats, small birds, frogs, insects and reptiles, and also feeds on grass that can facilitate digestion or act as an emetic. Up to 90% of the preyed animals weigh less than 200 grams (7 oz); occasionally it also hunts larger prey such as duikers, hares, flamingoes and young antelopes. The percentage of rodents in the diet has been estimated at 80-97%. Apart from vlei rats, other rodents recorded frequently in the diet include the African grass rat, African pygmy mouse and multimammate mice. Servals locate prey by their strong sense of hearing. To kill small prey, the serval will slowly stalk it, then pounce on it with the forefeet directed toward the chest, and finally land on it with its forelegs outstretched. The prey, receiving a blow from one or both of the serval's forepaws, is incapacitated, and the serval gives it a bite on the head or the neck and immediately swallows it. Snakes are dealt more blows and even bites, and may be consumed even as they are moving. Larger prey, such as larger birds, are killed by a sprint followed by a leap to catch them as they are trying to flee, and are eaten slowly. Servals have been observed caching large kills to be consumed later by concealing them in dead leaves and grasses. Servals typically get rid of the internal organs of rodents while eating, and pluck feathers from birds before consuming them. During a leap, a serval can reach more than 2 metres (6 ft 7 in) above the ground and cover a horizontal distance of up to 3.6 metres (11 ft 10 in). Servals appear to be efficient hunters; a study in Ngorongoro showed that servals were successful in half of their hunting attempts, regardless of the time of hunting, and a mother serval was found to have a success rate of 62%. The number of kills in a 24-hour period averaged 15 to 16. Scavenging has been observed, but very rarely. Gestation lasts for two to three months, following which a litter of one to four kittens is born. Births take place in secluded areas, for example in dense vegetation or burrows abandoned by aardvarks and porcupines. Blind at birth, newborn weigh nearly 250 g (9 oz) and have soft, woolly hair (greyer than in adults) and unclear markings. The eyes open after nine to thirteen days. Weaning begins after a month of birth; the mother brings small kills to her kittens and calls out to them as she approaches the "den". A mother with young kittens rests for a notably lesser time and has to spend almost twice the time and energy for hunting than do other servals. If disturbed, the mother shifts her kittens one by one to a more secure place. Kittens eventually start accompanying their mother to hunts. At around six months, they acquire their permanent canines and begin to hunt themselves; they leave their mother at about 12 months of age. They may reach sexual maturity from 12 to 25 months of age. Life expectancy is about 10 years in the wild, and up to 20 years in captivity. The IUCN (International Union for Conservation of Nature and Natural Resources) lists the serval as least concern; the animal is also included in CITES Appendix II. A major threat to the survival of the serval include the degradation of wetlands and grasslands. Trade of serval skins, though on the decline, still occurs in countries such as Benin and Senegal. In western Africa, the serval has significance in traditional medicine. Pastoralists often kill servals to protect their animals, though servals generally do not prey upon livestock. Servals occur in several protected areas across its range. 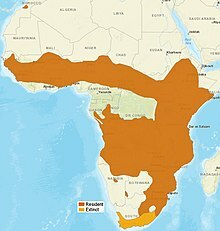 Hunting of servals is prohibited in Algeria, Botswana, Congo, Kenya, Liberia, Morocco, Mozambique, Nigeria, Rwanda, Cape Province (South Africa), and Tunisia; regulations apply in Angola, Burkina Faso, Central African Republic, the Democratic Republic of the Congo, Ghana, Malawi, Senegal, Sierra Leone, Somalia, Tanzania, Togo and Zambia. On 7 April 1986, a healthy hybrid kitten between a male serval and a female domestic cat was born; this kitten was larger than a typical domestic kitten and resembled its father in its coat pattern. It appeared to have inherited a few domestic traits, such as tameness, from its mother. The hybrid cat may have a doglike habit of following its owner about, and can be a good swimmer. Over the years, the savannah cat, a hybrid between domestic cat and serval, has gained popularity as a pet. In the United States, Savannah cats are banned in some states. ^ a b c d e f Thiel, C. (2015). "Leptailurus serval". The IUCN Red List of Threatened Species. IUCN. 2015: e.T11638A50654625. doi:10.2305/IUCN.UK.2015-2.RLTS.T11638A50654625.en. Retrieved 29 October 2018. ^ a b Schreber, J. C. D. (1778). "Der Serval". Die Säugethiere in Abbildungen nach der Natur, mit Beschreibungen. Erlangen: Wolfgang Walther. p. 407. ^ Severtzov, N. (1858). "Notice sur la classification multisériale des carnivores, spécialement des Félidés, et les études de zoologie générale qui s'y rattachent". Revue et Magasin de Zoologie, Pure et Appliquée (2). 10: 3–8, 145–150, 193–196, 241–246, 385–393. ^ Wozencraft, W.C. (2005). "Species Leptailurus serval". In Wilson, D.E. ; Reeder, D.M (eds.). Mammal Species of the World: A Taxonomic and Geographic Reference (3rd ed.). Johns Hopkins University Press. p. 540. ISBN 978-0-8018-8221-0. OCLC 62265494. ^ a b c d e f g h i j k l Sunquist, M.; Sunquist, F. (2002). "Serval". Wild Cats of the World. Chicago, US: University of Chicago Press. pp. 142–151. ISBN 978-0-226-77999-7. ^ Gray, J. E., ed. (1869). Catalogue of Carnivorous, Pachydermatous, and Edentate Mammalia in the British Museum. London, UK: Natural History Museum. p. 24. ^ Gray, J. E. (1874). "On the steppe-cat of Bokhara (Chaus caudatus)". The Proceedings of the Scientific Meetings of the Zoological Society of London: 31–33. ^ a b c d e f g h i j k l Hunter, L.; Bowland, J. (2013). "Leptailurus serval Serval". In Kingdon, J.; Happold, D.; Butynski, T.; Hoffmann, M.; Happold, M.; Kalina, J. (eds.). Mammals of Africa. London, UK: Bloomsbury Publishing. pp. 180–184. ISBN 978-1-4081-8996-2. ^ Jardine, W. (1843). "Himalayan serval". The Naturalist's Library. Volume 16. pp. 230–231. ^ Pocock, R. I. (1944). "Three races, one new, of the serval (Leptailurus) from North Africa". Annals and Magazine of Natural History Series 11. 11 (82): 690–698. doi:10.1080/00222934408527466. ^ Kitchener, A. C.; Breitenmoser-Würsten, C.; Eizirik, E.; Gentry, A.; Werdelin, L.; Wilting, A.; Yamaguchi, N.; Abramov, A. V.; Christiansen, P.; Driscoll, C.; Duckworth, J. W.; Johnson, W.; Luo, S.-J. ; Meijaard, E.; O’Donoghue, P.; Sanderson, J.; Seymour, K.; Bruford, M.; Groves, C.; Hoffmann, M.; Nowell, K.; Timmons, Z.; Tobe, S. (2017). "A revised taxonomy of the Felidae: The final report of the Cat Classification Task Force of the IUCN Cat Specialist Group" (PDF). Cat News (Special Issue 11): 58–60. ^ a b Werdelin, L.; Yamaguchi, N.; Johnson, W. E.; O'Brien, S. J. (2010). "Phylogeny and evolution of cats (Felidae)". In Macdonald, D. W.; Loveridge, A. J. (eds.). Biology and Conservation of Wild Felids (Reprinted ed.). Oxford, UK: Oxford University Press. pp. 59–82. ISBN 978-0-19-923445-5. ^ a b Johnson, W. E.; Eizirik, E.; Pecon-Slattery, J.; Murphy, W. J.; Antunes, A.; Teeling, E.; O'Brien, S. J. (2006). "The Late Miocene Radiation of Modern Felidae: A Genetic Assessment". Science. 311 (5757): 73–77. doi:10.1126/science.1122277. PMID 16400146. ^ Liddell, H. G. & Scott, R. (1889). "λεπταλέος λεπτός". An Intermediate Greek-English Lexicon. Oxford: Clarendon Press. ^ "Serval". Merriam-Webster Dictionary. Retrieved 1 April 2016. ^ a b c Liebenberg, L. (1990). A Field Guide to the Animal Tracks of Southern Africa. Cape Town, South Africa: D. Philip. p. 257. ISBN 978-0-86486-132-0. ^ a b c d Estes, R. D. (2004). The Behavior Guide to African Mammals: Including Hoofed Mammals, Carnivores, Primates (4th ed.). Berkeley, US: University of California Press. pp. 361–363. ISBN 978-0-520-08085-0. ^ a b c d Schütze, H. (2002). Field Guide to the Mammals of the Kruger National Park. Cape Town, South Africa: Struik Publishers. pp. 98–99. ISBN 978-1-86872-594-6. ^ Hunter, L. (2015). Wild Cats of the World. London, UK: Bloomsbury Publishing Plc. p. 75. ISBN 978-1-4729-2285-4. ^ a b Mills, M. G. L. (2005). "Genus Leptailurus Severtzov, 1858". In Skinner, J. D.; Chimimba, C. T. (eds.). The mammals of the southern African subregion (Third ed.). Cambridge: Cambridge University Press. pp. 408–412. ISBN 9780521844185. ^ "Pharaoh". Big Cat Rescue. 14 July 2016. ^ Hunter, L.; Hinde, G. (2005). Cats of Africa: Behaviour, Ecology, and Conservation. Cape Town, South Africa: Struik Publishers. pp. 76, 158. ISBN 978-1-77007-063-9. ^ Thiel, C. (2011). Ecology and population status of the serval Leptailurus serval (Schreber, 1776) in Zambia (PDF) (Thesis). University of Bonn. pp. 1–265. ^ Edwards, S.; Portas, R.; Hanssen, L.; Beytel, P.; Melzheimer, J.; Stratford, K. (2018). "The spotted ghost: Density and distribution of serval Leptailurus serval in Namibia". African Journal of Ecology. 00 (4): 831–840. doi:10.1111/aje.12540. ^ a b c Geertsema, A. A. (1984). "Aspects of the ecology of the serval Leptailurus serval in the Ngorongoro Crater, Tanzania". Netherlands Journal of Zoology. 35 (4): 527–610. doi:10.1163/002829685X00217. ^ Eklund, Robert. "4.2 Purring serval". Retrieved 7 March 2013. ^ Smithers, R. H. N. (1978). "Serval Felis serval – Schreber, 1776". South African Journal of Wildlife Research. 8 (1): 29–37. ^ Bowland, J. M.; Perrin, M. R. (1993). "Diet of serval (Leptailurus serval) in a highland region of Natal". South African Journal of Zoology. 28 (3): 132–135. doi:10.1080/02541858.1993.11448308. ^ Wackernagel, H. (1968). "A note on breeding the serval cat Felis serval at Basle Zoo". International Zoo Yearbook. 8 (1): 46–47. doi:10.1111/j.1748-1090.1968.tb00433.x. ^ Tonkin, B. A. (1972). "Notes on longevity in three species of felids". International Zoo Yearbook. 12: 181–182. doi:10.1111/j.1748-1090.1972.tb02319.x. ^ Faure, E.; Kitchener, A. C. (2009). "An archaeological and historical review of the relationships between felids and people". Anthrozoös: A Multidisciplinary Journal of the Interactions of People & Animals. 22 (3): 221–238. doi:10.2752/175303709X457577. ^ Engels, D. W. (2015). Classical Cat: The Rise and Fall of the Sacred Cat. Abingdon, UK: Routledge. ISBN 978-1-134-69293-4. ^ "Children, meet the new pet: a 3-stone African wild cat". 5 December 2017. Retrieved 6 April 2018 – via www.thetimes.co.uk. ^ "Wild Cat Hybrid Fad In California Concerning To Pet Experts". 5 November 2013. Retrieved 6 April 2018. ^ "Serval - San Diego Zoo Animals & Plants". animals.sandiegozoo.org. Retrieved 6 April 2018. ^ Casey, Liam (6 October 2016). "Serval cat owner rails against Ottawa's exotic animal bylaw". Retrieved 6 April 2018. ^ "Exotic pet laws in B.C." Retrieved 6 April 2018. ^ "Regulations Concerning the Private Possession of Big Cats: Canada - Law Library of Congress". www.loc.gov. 1 June 2013. Retrieved 6 April 2018. ^ "Regina family fights to keep African cat - CBC News". Retrieved 6 April 2018. ^ News, 69 (8 November 2017). "African serval rescued after found roaming Reading streets". Retrieved 6 April 2018. ^ "Family with two young children become first in Britain to adopt Serval". Retrieved 6 April 2018. ^ Frater, J. (2014). Listverse.com's Epic Book of Mind-Boggling Lists: Unbelievable Facts and Astounding Trivia on Movies, Music, Crime, Celebrities, History, and More. California, US: Ulysses Press. p. 232. ISBN 978-1-61243-297-7. "Serval". African Wildlife Foundation. Retrieved 13 March 2007. "Serval fact sheet". San Diego Zoo. Retrieved 25 July 2013.